The engagement highlighted efforts by both sides to develop the defense aspect of their comprehensive strategic partnership. Last week, Australia and Singapore held another iteration of their joint ministerial meeting. While this was just one of several developments within the broader bilateral comprehensive strategic partnership, it nonetheless put the focus on the ongoing defense relationship between the two Asian states. As I have noted before in these pages, Australia and Singapore have long maintained a security relationship as part of their wider ties, which were elevated to the level of a comprehensive strategic partnership back in 2013. Beyond the usual components of this aspect of relations such as exchanges and exercises, both countries are longstanding members of the Five Power Defense Arrangements (FPDA) — the oldest standing multilateral security agreement of its kind in the region — and Australia is among the key places where the Singapore military has conducted overseas training, which it considers critical for its development. Over the past few years, the relationship has deepened still further despite lingering challenges, including the expansion of Singapore’s military facilities in Australia and the upgrading of certain exercises and exchanges. That has continued on into 2019 as well, with visits and meetings continuing on as scheduled. Last week, the defense relationship was in the headlines again with the holding of the 11th iteration of the Singapore-Australia Joint Ministerial Committee (SAJMC) meeting. 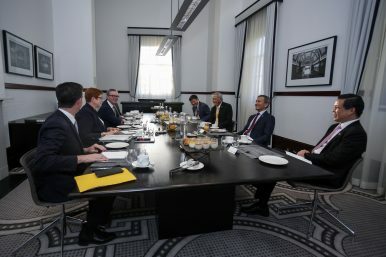 The meeting in Sydney, Australia, which featured foreign, defense, and trade ministers, also provided an opportunity for both sides to discuss issues related to the security realm of the relationship as well. As is usually the case, during the meeting, the two defense ministers, Singapore’s Defense Minister Ng Eng Hen and Australia’s Defense Minister Christopher Pyne, discussed a range of issues on defense collaboration, including the status of bilateral ties as well as regional and global issues of mutual interest such as counterterrorism and regional multilateralism. The two sides also flagged upcoming developments in bilateral defense relations as well. Per Singapore’s defense ministry (MINDEF), one key item discussed in this regard was progress made in the joint development of training areas and advanced training facilities in Queensland – including Instrument Combined Air-Land Ranges and Urban Operations Live-Firing Facilities – with construction commencing later this year. Another item that came up was both sides agreeing to elevate the memorandum of understanding on military training and training area development in Australia to treaty status. The two countries agreed to do so as a priority in 2019, indicating that there may be progress seen with respect to this in the coming months as well. The new Australian defense chief’s first trip to the Southeast Asian state highlighted some of the ongoing activity in the security side of the relationship. What’s in the New Australia-Singapore Military Exercise?Australia-Singapore Military Ties in Focus With Navy Chief VoyageThe Enduring Strategic Logic of the New Australia-Singapore Military Training DealA New Base For Singapore's Fighter Jets in New Zealand?What’s Behind the Nixed Singapore-New Zealand Fighter Jet Base Deal?